Tuesday November 28th is #GIVINGTUESDAY. #GivingTuesdayNWO is a global day dedicated to giving. Following Black Friday and Cyber Monday, #GivingTuesdayNWO is a day when individuals, charities, families, businesses and community centers come together for one common purpose: to celebrate generosity and to give. #GivingTuesdayNWO will be held on November 28, 2017. PACT has registered with the Toledo Community Foundation’s #GivingTuesdayNWO matching grant program. This Foundation program will match on a one-to-one basis (up to $500.00) any money donated to PACT on November 28, 2017. Make a donation online on Tuesday, November 28 at this secure website by clicking on the donate button at the top of the page. You can use PayPal or your credit card. If online donation isn’t possible, you may write your check to PACT, dated November 28, 2017 with #GivingTuesdayNWO on the memo line, and mail it to PACT P.O. Box 1033, Sylvania, OH 43560. Please include the following: Name, Address, Phone # and Email address. October is Polish Heritage Month; a great time to learn more about your Polish Heritage. Knowledge is power! Read these books to learn more about your local Polish heritage and customs. Learn interesting facts about the people who settled in the Toledo and surrounding area. 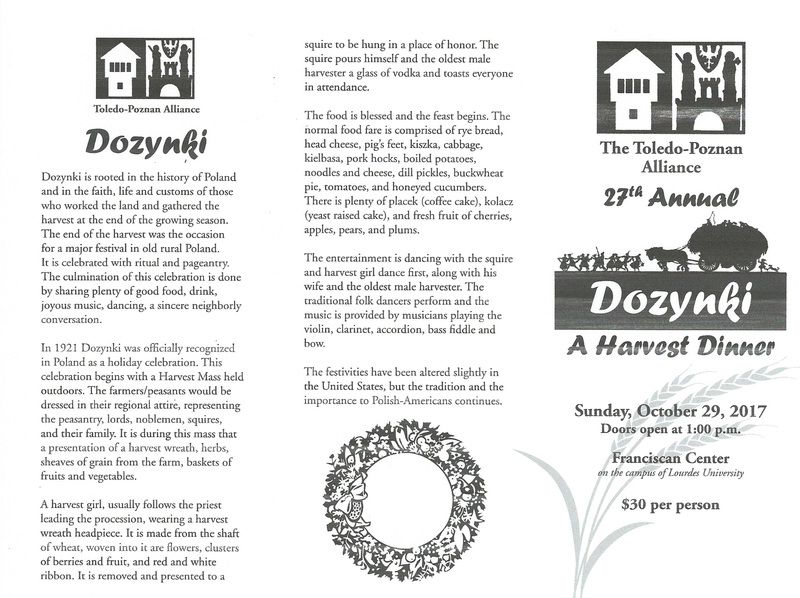 Call 419-841-2902 to purchase tickets for Dozynki or for more information. Or send your check payable to Toledo-Poznan Alliance to Rosalie Hinde, 7402 Caracole Ct., Sylvania, Ohio, 43560. 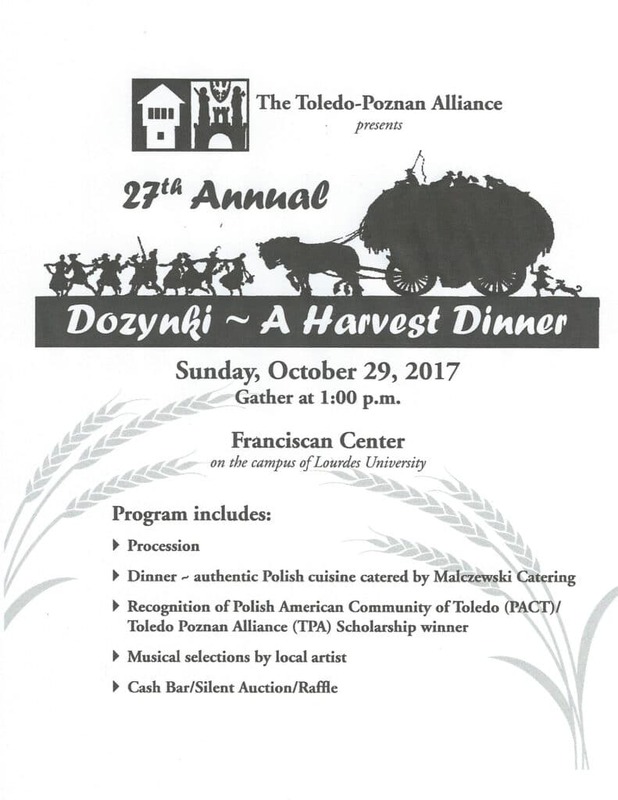 The Polish American Community of Toledo and Toledo Poznan Alliance are proud to announce the 2017 Scholarship winners. Each winner will receive $1,000.00 toward their college tuition. Alexander Zuchowski. Alex will be a sophomore at the University of Cincinnati this fall. Alex is the 2017 recipient of an Engineering and Applied Sciences Freshman Scholastic Award and the 2017 President’s award for Educational Excellence. He is a member of the National Honor Society and the Marching and Concert Band at the University. Alex dances in the famous Echoes of Poland dance group. Chase Mackiewicz. Chase will be a sophomore at Perrysburg High School this year. 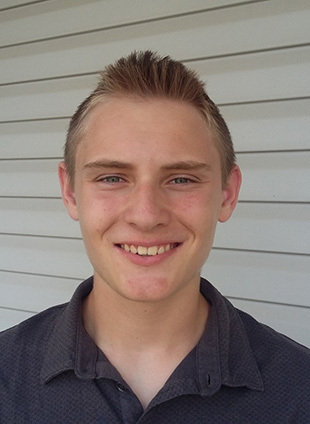 He is on the honor roll and a recipient of a Toledo Youth Orchestra Scholarship. He also participates on the Perrysburg H.S. Track Team. He is the 5th generation Mackiewicz to play in the fabulous Toledo based Polish American Concert band (trumpet). Marie Nitkiewicz. Marie attends Bowling Green State University, studying to be a high school history teacher. She is a multiple Americanism and Government Test Winner (2014 and 2015), a member of Future Teachers of America (2014 and 2015) and active in the Education Learning Community (2016-2017). Nathan Oblizajek. 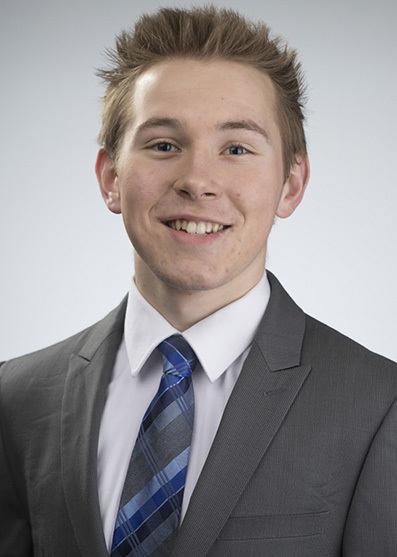 Nathan will be a sophomore at Ohio Northern University in the Pharmacy Doctorate Program. 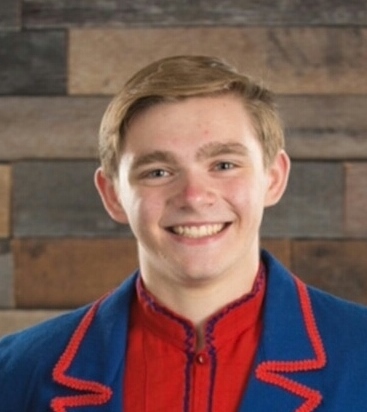 He is a National Honor Society Member (2014-2016), a Bishop’s Cross Recipient (2016) and has received an outstanding Science Student Award (2016). He regularly volunteers for Habitat for Humanity. Any changes in these dates will be sent to all participants and posted on our facebook pages and on our website. Get your taste buds ready for another great Kielbasa Cook Off sponsored by the Polish American Community of Toledo. This year the cook off will be held on Saturday, May 6th at St. Clement Community Center, 2990 Tremainsville Rd. Proceeds from the cook-off will benefit the PACT/Toledo Poznan Alliance Scholarship Competition, which has awarded more than $17,000 to students over the past five years. Proceeds will also help the capital campaign to develop a Polish community center in the Toledo area. There is still room for more contestants. 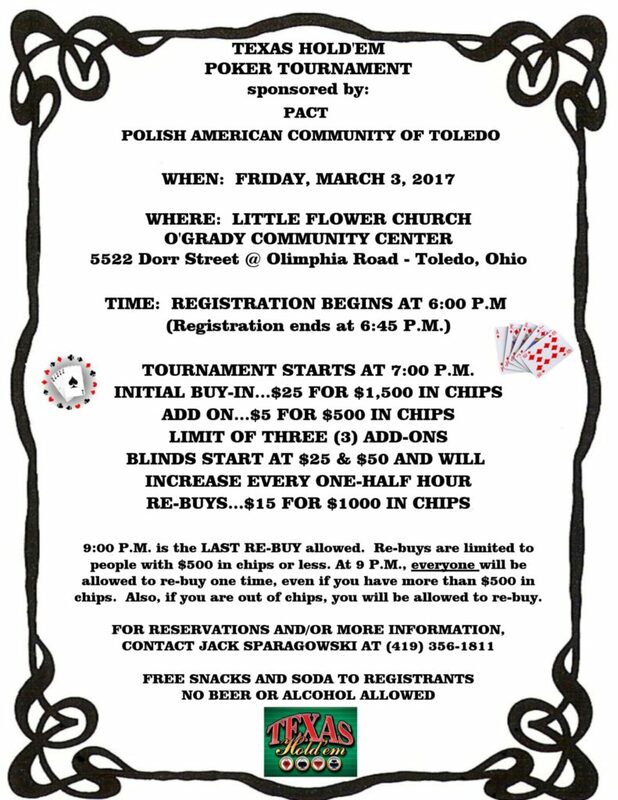 If you are interested in competing in this event, call Jack Sparagowski at 419-356-1811 or email us at info@polishcommunity.org. The deadline to enter is April 15th. Check our website and facebook page for more information and updates in the near future. Kielbasa Cook Off Call For Contestants! (Toledo, OH) — The Polish-American Community of Toledo (PACT) has announced that the organization is looking for contestants and sponsors for the Sixth Kielbasa Cook-Off, to be held on Saturday, May 6, 2017 at the St. Clement’s Community Center, 2990 Tremainsville Rd., Toledo. The hours for the event will be announced at a later date. The Kielbasa Cook-off, which was last held in April 2016, features homemade kielbasa from old family recipes. The event, opened to the public, allows people to sample the special kielbasa recipes and vote for their favorite. Amateur kielbasa makers from all over the area compete for the title of Toledo’s Kielbasa “King” or “Queen”. In 2016, nearly 750 people attended as twelve contestants battled for bragging rights. The team of “Polska Pryba” led by Jeremy Pryba received the most votes and the title Kielbasa King. Besides earning the distinction of having the best homemade kielbasa in the area, contestants can also receive cash awards and / or trophies for their efforts. The competition is open to anyone that makes their own kielbasa. Commercial entries will not be part of the amateur cook-off. ”People in northwest Ohio and southeast Michigan are so proud of their ethnic heritage. Most families have those special homemade recipes that have been passed down from generation-to-generation. PACT is looking for best homemade kielbasa recipe. This is a friendly competition. We want to taste that secret family recipe for kielbasa,” said Stan Machosky, Past President, PACT. In addition to contestants, PACT is also looking for sponsorships for the Kielbasa Cook-Off. “We’ve had requests from the Polish community, elected officials, and local media to make the Kielbasa Cook-Off bigger. There’s been some interest in expanding the Kielbasa Cook-Off with a separate commercial competition, as well as making it a two-day event. The market is dictating that they want this event expanded. To do that, PACT would need more community support and several corporate sponsors,” said Matt Zaleski, 2016 PACT President. Money raised goes to fund the annual PACT / Toledo Poznan Alliance (TPA) Scholarship Competition and the capital campaign for development of Polish Community Center in the Toledo area. Over the past five years, PACT and TPA have awarded over $17,000 in scholarship money to area Polish-American high school and college students. PACT would like to hear from interested contestants or sponsors no later than March 1, 2017. Amateur kielbasa makers who are interested in participating can contact PACT Board Member, Jack Sparagowski at 419-356-1811, or email PACT at info@polishcommunity.org. Sign Up is now open for the 2016 Kielbasa Klassic 4-Man Golf Scramble! Includes golf, cart, food, beer, pop, team skins, door prizes, challenge holes, and the famous “Kielbasa Klassic” t-shirt. Deadline to enter is July 30, 2016. Register at the Kielbasa Klassic website by clicking here. Right-click the button above and select Save Target/Link As… to save the registration form to your computer. Please direct any questions to Tim Paluszak at 419-410-6167.
excerpted from a longer study by David Gwidon Chełmiǹski, Ph. D.
Not even a year after the formation of the “Warsaw Pact” mutual defense alliance in 1955, Poland suddenly made it into the world news headlines with the first significant uprising of the workers voicing dissatisfaction with the centrally-controlled Marxist economic system which had been imposed upon them in the decade since the Second World War, and remarkably, Poznaǹ, was at the center of what was happening. After the Minister of Machine Industry withdrew several promises given at the Polish capital of Warszawa to a delegation of workers from a metal Industries factory at Poznaǹ, a strike started spontaneously at the multi-factory complex at six in the morning of Thursday June 28th, 1956. Around eighty percent of the workers were protesting the increased workload and loss of bonus pay and demanding compensation after the government had suddenly raised their required work quota. Students and workers from other plants joined their procession. Between 9 and 11 a.m., 100,000 people had gathered at the Adam Mickiewicz Square in front of the old German Kaiser’s Imperial Palace, demanding lower food prices, wage increases, revocation of some recent changes in the law which had eroded work conditions and a visit by Poland’s Prime Minister Józef Cyrankiewicz. The crowds stormed a prison at ulica Młyǹska, releasing hundreds of prisoners, distributed firearms from the prison’s arms depot among themselves, and attacked the Communist Party’s local headquarters and the office of the Ministry of Public Security. By six p.m., the protesters had seized many government buildings, including a radio-jamming station and police stations in outlying districts, and the military school at the Poznaǹ University of Technology and the prison camp in Mrowino, destroying police records at the district courthouse and procurature as well as at a police station. The city was pacified by Saturday June 30th, 1956. An estimated fifty-seven to over one hundred civilians had been killed, and about six hundred people were wounded. By nine p.m. a wave of detentions had begun—the detainees were taken to the airport and subjected to brutal interrogations. Seven hundred forty-six individuals were detained for over five weeks, until Wednesday August 8th, 1956, while prosecutions carried on for many years. Clearly encouraged by the Polish example of voicing their dissatisfaction with the Communist regime and getting some significant changes, Hungary began its own uprising on Tuesday October 23rd, 1956.